Australian Government's Secret 'Cabinet Files' Were Found In ... An Old Cabinet : The Two-Way The ABC says thousands of pages of classified and sensitive documents were left in two filing cabinets, which the government sold for cheap at a secondhand shop, because it couldn't find the keys. Australian Prime Minister Malcolm Turnbull's government is looking into how hundreds of secret documents were left inside two large cabinets that were sold. 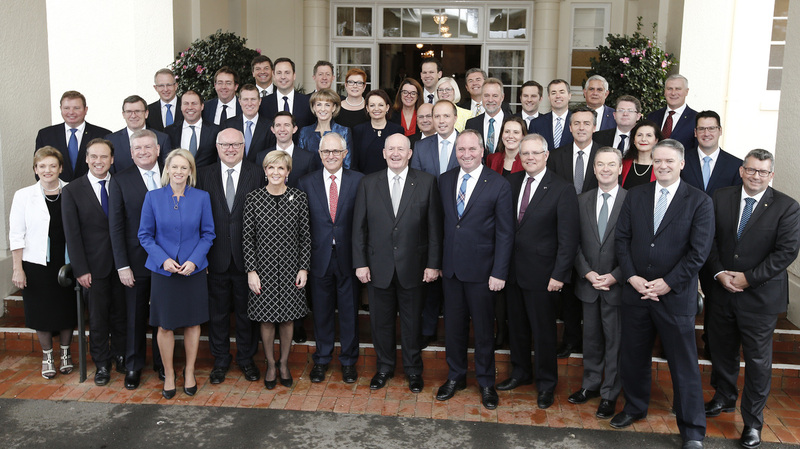 He's seen here with members of his Cabinet after they were sworn in in 2016. Australia's government is holding "an urgent investigation" into how hundreds of classified documents about the interior workings of several recent administrations found their way to the Australian Broadcasting Corp. The ABC says the thousands of pages of documents had been left in two filing cabinets, which the government then sold off at a secondhand shop. The cabinets were bought cheap, the network says, because they were locked and the keys had been lost. Inside the cabinets were records of five separate governments that spanned nearly 10 years; some of them refer to current members of Prime Minister Malcolm Turnbull's Cabinet. The ABC began publishing parts of the files this week, revealing the embarrassing inner workings of government — and, today, reporting that the trove of documents also include references to at least two other previously unknown breaches, in which hundreds more secret and sensitive documents were either lost or left unsupervised. Dubbing the documents the Cabinet Files, the network calls it "one of the biggest breaches of cabinet security in Australian history," adding that "the story of their release is as gripping as it is alarming and revealing." Former immigration minister Scott Morrison, who's currently Turnbull's treasurer, acted in late 2013 to limit the number of approved asylum seekers by arranging to "delay security checks so that people close to being granted permanent protection would miss the deadline" — a move that reportedly affected 30 asylum seekers each week. Looking to cut spending under Prime Minister Tony Abbott, his top treasury and finance officials considered denying welfare to anyone who's under 30. A range of scenarios were considered that targeted "job snobs," the ABC says, but the plan was shelved over a potential backlash. After controversial commentator Andrew Bolt was successfully accused of breaking the Racial Discrimination Act in 2011, the Cabinet later asked Bolt about changing the law's "unreasonably restrictive" reach — and "was the only person specifically named as having been consulted," the ABC says, citing draft legislation that is part of the files. "Nearly 200 top-secret code word protected and sensitive documents were left in the office of senior minister Penny Wong when Labor lost the 2013 election," the ABC says. The materials dealt with topics ranging from details of counterterrorism operations to how to defend the United Arab Emirates from Iran. Those documents were eventually found by security staff, who saw them destroyed. Nearly 400 national security files went missing from the Australian Federal Police over the course of five years, from 2008-2013. The ABC says those classified records were from "the powerful National Security Committee (NSC) of the cabinet, which controls the country's security, intelligence and defense agenda." "The cabinet secretariat's general practice was to give up searching and write off lost documents if they could not be found" after repeated attempts. When ABC began publishing some of the news from the documents this week, it triggered speculation about a possible leak in the current government that Turnbull has led since 2015. But the network says there was no leak and that no one broke the law — instead, someone finally got around to drilling out the locks on the two heavy cabinets that had been sold without any matching keys. "The documents were in two locked filing cabinets sold at an ex-government sale in Canberra," the ABC says. "A nifty person drilled the locks and uncovered the trove of documents inside." The cabinets and their contents were bought "for small change" in a sale that could have been made to anyone, the network says. It adds, "The thousands of pages reveal the inner workings of five separate governments and span nearly a decade. Nearly all the files are classified, some as 'top secret' or 'AUSTEO,' which means they are to be seen by Australian eyes only." The ABC isn't releasing any names or details about who bought the old, information-rich cabinets, or how it learned about them. Citing confidential sources, the network says it will "protect their privacy at all costs." After news of the massive security breach broke, the Department of the Prime Minister and Cabinet provided no more details, releasing a statement saying only that it's looking into "the circumstances around the disposal of two Commonwealth Government filing cabinets that allegedly contained classified material." Under Australian law, the Cabinet records would have become public only after at least 20 years had passed. But thanks to those other, more common cabinets, they're being scrutinized now.